In one of last week’s photos of my 1782 farmhouse in the States was a window quilt made from a quilted mattress protector. I picked it up, along with a dozen or so others, at various rummage sales. A rummage sale is an op shop on steroids. Church groups, school groups or scouting groups may sponsor a rummage sale once or twice a year. The sales fill large gymnasiums and last an entire weekend. But by Sunday afternoon, everything must go! That is when the fill-a-bag-for-$2-sale is on. That’s the time to get old bed sheets to use as painting drop cloths, or quilted mattress protectors to insulate windows. While I have yet to hear about a rummage sale in Wanganui, I am known to frequent op shops about town. Last year while in one fine establishment looking for a quilted mattress protector, I ran across a shelf of wool blankets at $3 each. My wife will tell you I have a fetish for wool blankets, but I will argue it is a fetish for any high quality product made of high quality materials. I also have a fetish for warm homes and low power bills. I am happy to report that our power bill for June was $20.67. Which reminds me, one of the best ways to cut a power bill by 10% or 20% is to take advantage of the discount for prompt payment. For the average New Zealand home, that means a discount of $25 – $50 each month. One way I make sure I remember to pay early is to walk from the mailbox straight to the computer and pay online. Done and dusted. 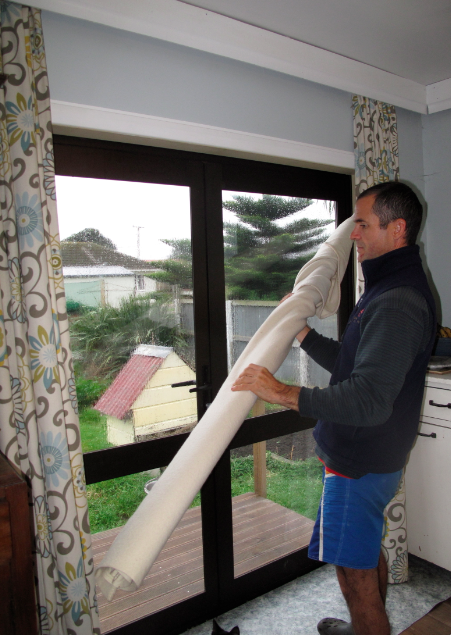 All this is a long way round to today’s topic – back by popular demand – window battens, or as a more practical person has recently called them, window blankets. 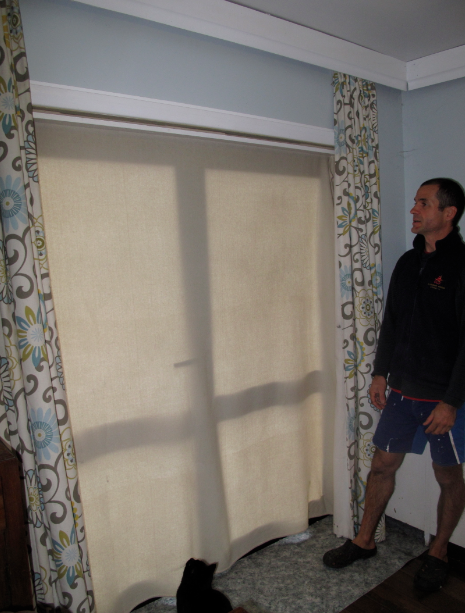 I wrote about this Yankee/Kiwi hybrid of a window quilt over a month ago and people are still telling me they use them and have noticed a difference in warmth retention. That’s awesome…for them. But winter is only half over and others may not have seen that article. Single-pane windows are one of the biggest sources of heat loss in a home. 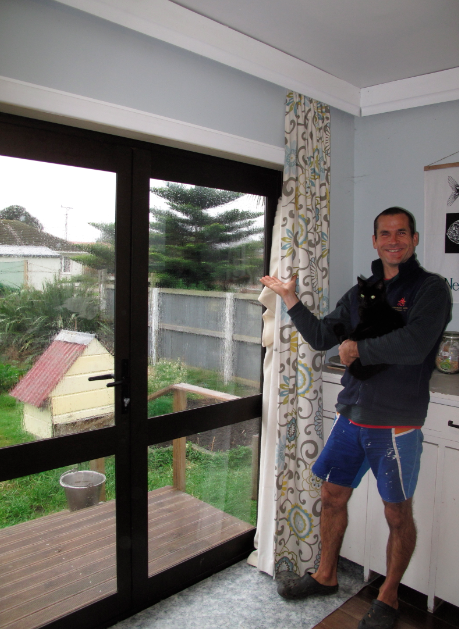 For those who cannot afford double-glazing or thermal curtains, this is the lowest cost / highest performance option. 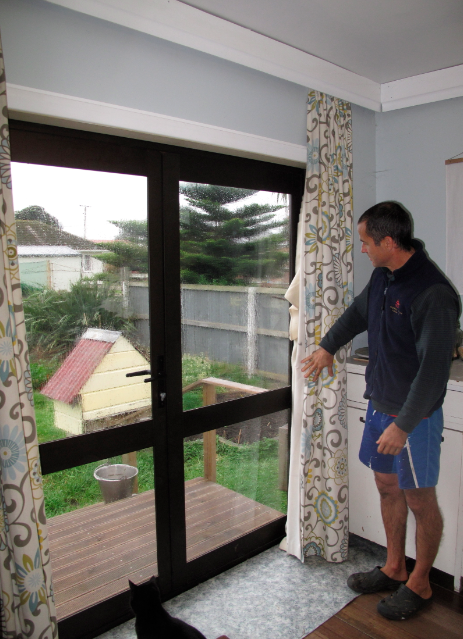 A tight-fitting window blanket offers the performance of double-glazing or of the best thermal curtains at a small fraction of the cost. I am “trialing” a number of variations. The prototype I wrote about consists of a blanket “sandwiched” between two long, thin pieces of wood (25 mm X 25 mm, and 25 mm X 5 mm) fixed together with short screws. 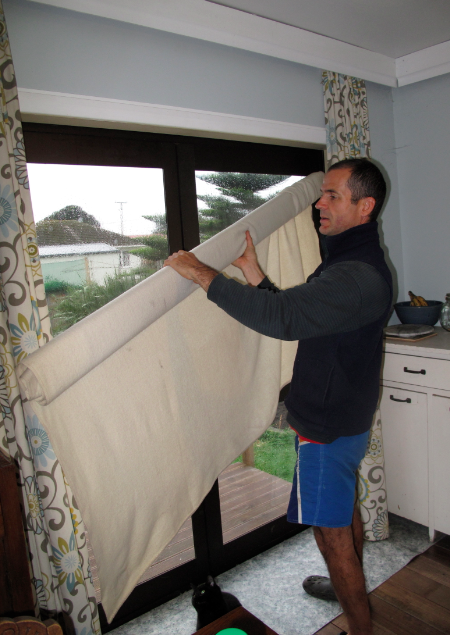 As you can see from the pictures, the wood is wedged at the top of the window frame and the blanket is held in place by gravity. It takes 10 to 15 seconds to take down, role up and put away in the morning, and about the same to put back up in the evening. Another variation I’m using consists of a wool blanket draped over a single piece of wood measuring 10 mm by 50 mm. 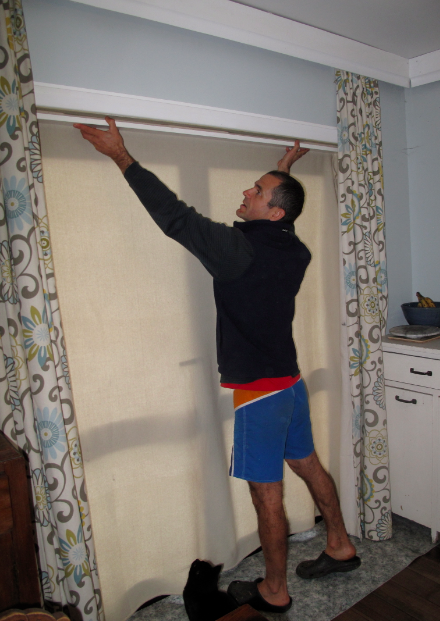 The board is wedged at the top of the window frame and the blanket falls front and back. This version is easier to make, but does not suit daily removal and replacement because it takes a while to square up the blanket. We use this version in some south-facing windows where we plan to leave them for the next two months. At this time of year, only northerly-facing windows receive the heating provided by direct sunlight during the day. But at night they lose heat just as southerly windows do. Thus the removable window blankets described above.